The longing feeling to finally meet 3 of the line-up for yesterday’s K-Content Expo 2018’s Kpop Concert must finally been answered because of the awesome performances given to us through the 1.5 hour concert. 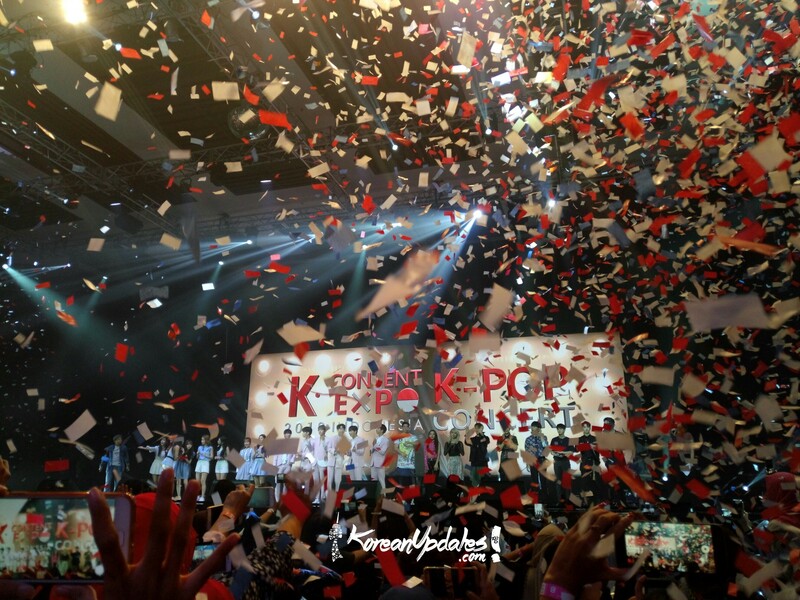 The awaited concert was completed by Snuper, K.A.R.D, Lovelyz, Lyn, and Highlight whom gave the fans of Korean Pop a night that is hard to forget. It was the first time for Snuper, Lovelyz, and popular soloist with thousands of well-received OSTs, Lyn, to come to Indonesia, but since the beginning, they expressed how they were overwhelmed by the response of the audiences. Snuper, who in the press conference prior to the concert said Indonesia’s Nasi Goreng (fried rice) is a must-eat food, opened the night with “The Star of Stars”, “Platonic Love”, and “Tulips”. The group successfully showed us different charms through the 3 songs as all of them colored with different concepts. The second performer, K.A.R.D, continuously expressed their happiness to be back again to Indonesia 4 months after their last visit. They pumped up the heat inside the venue with their stages of “Ride on the Wind”, “Don’t Recall”, and “Oh Na Na”. Indonesian singer, Calvin Jeremy, joined the festive with his songs “Alright” and “Nostalgia”, before followed by the third performer, Lovelyz. It was the first time for Lovelyz to perform in front of Indonesian fans, so we were amazed by the fanchant which was blazed throughout their performances. The girls perfectly performed their hits “That Day”, “Now, We”, and “Ah-Choo”, which were completed by the chant of the audiences. One of our favorite singers, Lyn, was the 2nd to last performer and she 100% owned the stage with “My Destiny”, “Back in Time”, and “We Used to Love”. You don’t have to be her fan to be completely immersed by her performance because she would let you be one while you enjoy her stage presence. The highlight of the night was literally Highlight, who is finally back again years after their last visit to Jakarta. The longing feeling for sure could be felt as the boys sang their songs “Plz Don’t be Sad”, “Calling You”, and “Beautiful Night”. The concert felt so short because of how both the performers and audiences seemed to enjoy the show. Even with each performer only given 3 songs, the concert felt 3 times happier because of how energized and harmonious the audiences were in all of the performances. We would like to thank iLOTTE Indonesia, KOCCA, and Korean Cultural Center Indonesia for the invitation to witness yet another awesome event which made us to want more! Don’t forget to enjoy the rest of Korea Festival 2018 throughout this month of October, Jjangers.